Amsterdam is the home of canals, Vincent Van Gogh -- and liqueurs! Directly across the street from the Van Gogh Museum is the House of Bols Cocktail and Genever Experience. If the name Bols sounds familiar, it should: Bols makes a broad range of liqueurs which many of us know and enjoy. What you may not know is that the Bols name dates to the 1500s. 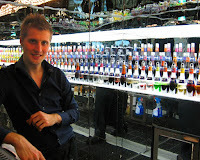 And you may also be unaware that Lucas Bols (not the founder, but the second generation Bols to be raised in the industry) concocted some 300 types of liqueurs and cordials. 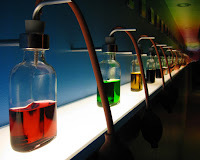 The Bols Experience is not a static museum; it is a truly interactive experience that involves testing your senses of taste and smell -- both of which are vital when enjoying food and beverage. You're invited to crush various botanicals in your hands, then inhale the aromas. At the scent station, you're challenged to guess the scents before lifting the placard to learn what smells you've been experiencing. The tour may "end" at the bar, but the experience continues -- with a cocktail you choose based on your preferences for sweet vs. savory, and complex vs. simple flavours. My preferences led me to the Improved Holland Gin Cocktail made with the newest Bols liqueur, Bols Genever. Genever is really an old blend revisited: a blend of a multigrain distillate called maltwine and a proprietary (i.e., "secret") blend of botanicals. The result is a malty spirit much more complex and interesting than London dry gin, the other spirit that comes to mind when one mentions botanicals. Though the Genever web site says it's currently only available in New York, Los Angeles, and one place in New Hampshire (go figure...), the company's PR rep says it's "available throughout New York, California, Illinois, Massachusetts, Rhode Island and Arizona at exclusive liquor shops and bars with plans to continue rolling out nationally through 2009."